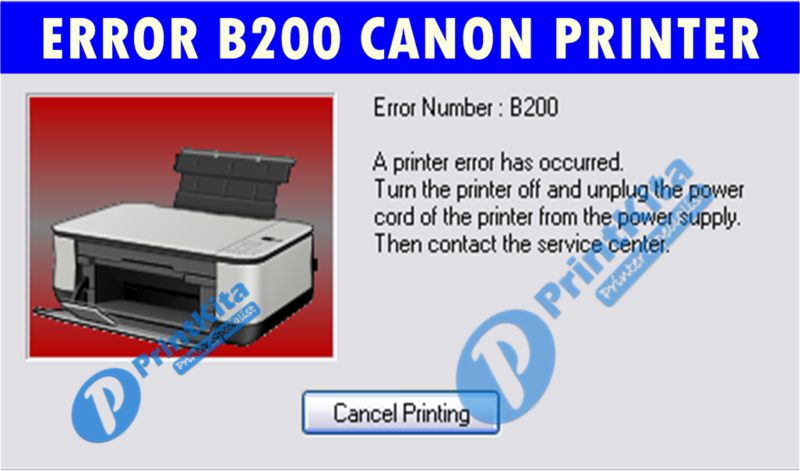 Error B200 is most frequently found on Canon Printers, Error B200 means the voltage or temperature of the printhead is not normal. The printhead could defect, to fix Error B200 on Canon printer is very simple ways. These troubleshooting guide can be applied for 2 cartridges and 4+ cartridges Canon Printers. Open the top cover of the printer then wait for the cartridge cradle stop moving, and then remove the ink cartridges from your printer. Reinstall all of the cartridges into the printer then close the top cover. Unplug the Printer power cable from the electric source and leave it for at least 5 minutes. Wait for the printhead to cool and there is nothing residual electricity on the printer. Plug the Printer power cable Back. If the Error B200 still occurred, try to replace the ink cartridge with a new one. If the error B200 on your Canon Printer still occurred try to replace printer board or contact Canon Printer Technician near you.